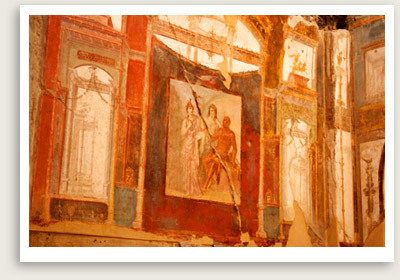 Customize this upscale, private Pompeii – Herculaneum tour from Rome to include or substitute a tour of Mt. Vesuvius. Private Pompeii – Herculaneum tours from Rome. Other departure points available. Private Pompeii, Herculaneum tours from Rome Include: Our private Pompeii – Herculaneum tours include upscale transportation, licensed expert tour guides for Pompeii and Herculaneum, taxes, toll, parking, entrance tickets to Pompeii and Herculaneum. 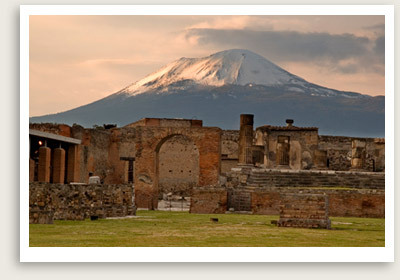 Our private Pompeii and Herculaneum tour is one of the most amazing day tours from Rome. On our Pompeii and Herculaneum private tours, our expert tour guide will first take you on a tour of Pompeii. Thirty feet of hot mud and volcanic ash buried this ancient Roman city completely when Mt. Vesuvius erupted in 79 A.D. Your guided Pompeii tour will be conducted by our excellent tour guide who will take you through this once-prosperous city, established in 12th century B.C. You will see villas, baths, storefronts, houses, pizza parlors, forum and other artifacts from Pompeii’s heyday. Your private Pompeii & Herculaneum tour guide will also take you on a private tour of Herculaneum, also destroyed by Mt. Vesuvius in 79 A.D. While Herculaneum is smaller than Pompeii, its buildings are much better preserved. Simply incredible!